Vietnam-era Veteran James Preston (pictured above) uses his mobile phone much like any other person. He reads his email, surfs the net, streams video, even plays a game or two. Like 5.6 million other Veterans, he also gets his VA health care scheduling reminders through VEText, an interactive mobile solution to remind Veterans of upcoming appointments via unsecured text messaging. 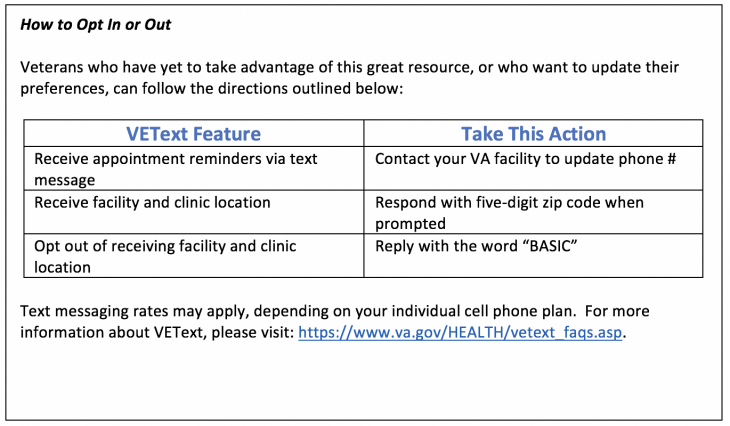 VA launched VEText in March 2018 and since has made enhancements along the way. Most recently, VA can now send facility and clinic location in their unsecured text message appointment reminders. This feature improves the experience for Veterans because it offers them more detailed information about their scheduled appointments. Deanna Callahan is an innovation specialist and the National Program Manager for VEText. 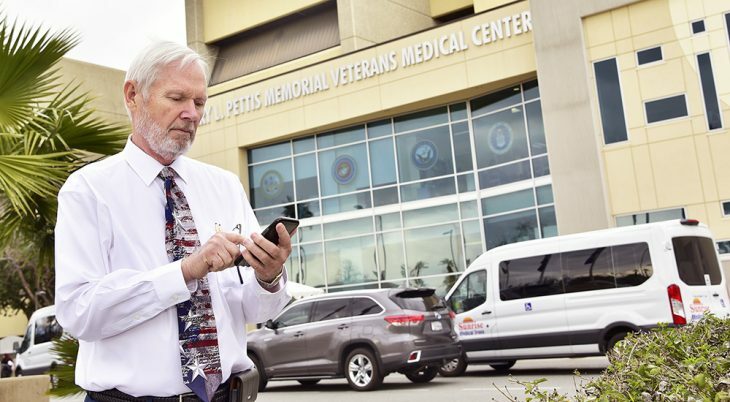 Working out of the VA Loma Linda Healthcare System, she and her team recognized the community standard for health care scheduling was text message appointment reminders – and they wanted to bring that capability to VA.
And the No Show rate that Callahan wanted to impact? That has decreased from 13.7% to 11.7% since the VEText deployment. Furthermore, an overwhelming majority of Veterans like the enhanced access. Only 4% have opted out of the VEText program. VEText is configured locally by each facility to send messages about appointment reminders. Callahan worked with VHA’s Office of Veterans Access to Care (OVAC) to plan, resource, and deploy this enhanced capability across the country. Since the beginning, James Preston has been one of their staunchest advocates. Preston helped test the system before full implementation and offered critical recommendations to improve the effort. “At first, the rules were very encompassing, and the text message wasn’t as intuitive as I had envisioned. Preston may be 71 years old, but he operates his mobile device as well as any millennial or Gen-Xer. His role in helping to enhance access and improve the experience for Veterans has been terrific. 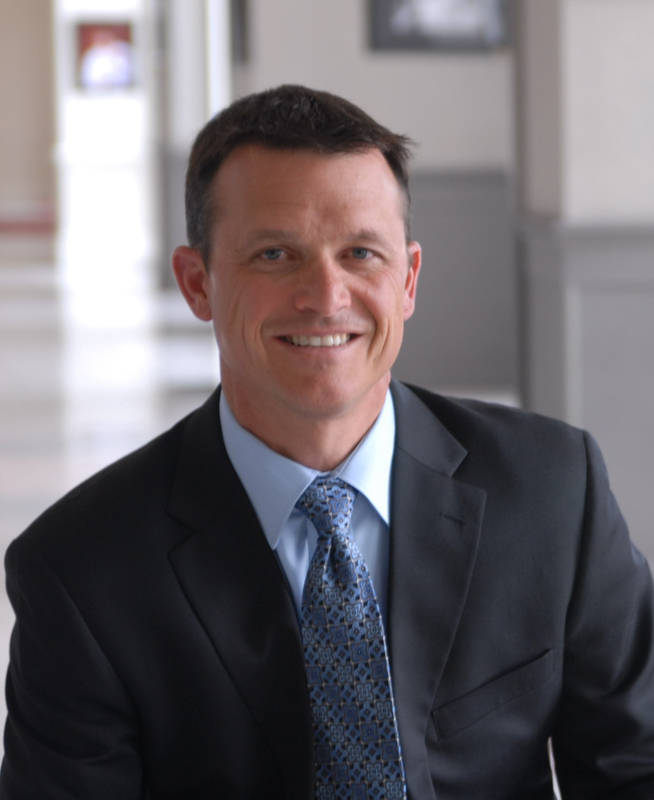 Jason T. Strickland, Acting Director of Communications, VHA Office of Veterans Access to Care (OVAC), is a retired U.S. Army officer and Leadership VA 2018 Fellow who has worked for the VA for three years.